"Patas" redirects here. For the Romanian village of Pătaş, see Prigor. The patas monkey (Erythrocebus patas), also known as the wadi monkey or hussar monkey, is a ground-dwelling monkey distributed over semi-arid areas of West Africa, and into East Africa. It was formerly considered the only member of the genus Erythrocebus, but the Blue Nile patas monkey, previously synonymized with this species, was resurrected in 2018. There is some confusion surrounding the number of valid subspecies, with some listing four, and others listing two; the western Erythrocebus patas patas (Common patas; with a black nose) and the eastern Erythrocebus patas pyrrhonotus (Nisnas; with a white nose). Others, however, have suggested that at least some of the features used to separate these subspecies are merely variations in the female's facial pattern during pregnancy. On the other hand, the change in the nose during pregnancy occurs only in the West African populations. The male patas monkey grows to 60 cm (24 in) to 87 cm (34 in) in length, excluding the tail, which measures 75 cm (30 in). Adult males are considerably larger than adult females, which average 49 cm (19 in) in length. Adult males average 12.4 kg (27.3 lb) and adult females 6.5 kg (14.3 lb), showing a high degree of sexual dimorphism. Reaching speeds of 55 km/h (34 mph), it is the fastest runner among the primates. The life span in the wild can be up to about 20 years. It is found in many parts of central, western, and eastern Africa. It also has been introduced to Puerto Rico. 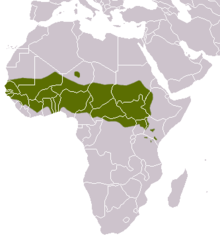 The species avoids dense woodlands and lives in more open tropical savanna. The patas monkey lives in multi-female groups of up to 60 individuals (although much larger aggregations have been reported). The group contains just one adult male for most of the year. During the breeding season, there are multi-male influxes into the group. Once juvenile males reach sexual maturity (around the age of four years) they leave the group, usually joining all-male groups. The adult females in the group initiate movement of the group with the male following their lead. Variation in the female social structure of patas monkeys has been observed across different populations. This variation may be dependent on food resources, as conflict between individuals is often a result of competition for limited resources. Higher rates of conflict over dense, but limited, food, such as fruit bushes, is associated with more stable, well defined dominance hierarchies than habitats with more diffuse resources, such as insects. Variation in the availability of these resources has been associated with variation in dominance hierarchies among females. Conflict among females has also shown the presence of recognition among matrilineal relatives. It has been observed that, shortly after conflicts among two females, patas monkeys often act differently toward each other than if they had not been in conflict. Females often “reconcile” with each other by activities such as sitting together and grooming. While this reconciliatory behavior is observed even between unrelated individuals, it is most common among matrilineal relatives. Dominance structure has relatively little effect on the probability of reconciliation occurring, except that the alpha-female is the least reconciliatory of the females. Affiliation toward matrilineal relatives is common in other primates as well, such as vervet monkeys. Mating in patas monkeys is seasonal and occurs during the wet season. During periods when females are not receptive, relatively stable groups with one adult resident male and several females are the norm. This leaves an excess of males that either form all male groups or live on their own. During the mating season, resident males may be chased away by invading solitary males. This usually results in the formation of multi-male, multi-female groups shortly thereafter, as more males invade a group. The new resident male does not chase away subordinate invading males, but rather focuses on mating with females. At the end of the mating season, one-male, multi-female groups stabilize. One male remains as the resident male and chases other males away. In some instances, submissive males are tolerated by the resident male for short periods of time; however, they rarely remain in the group for more than several days. Young males have been observed to leave their natal groups anywhere from two to four years of age. However, one study showed that most juveniles left before they were three, which is before most males reach sexual maturity. This contrasts with an earlier study in which juveniles were observed to leave later, at sexual maturity, indicating that there may be variation between groups. The reason young males leave their natal group is also contested. Dominant males have been observed to act aggressively toward younger males in captivity. However, observations of wild patas monkeys has shown young males leaving the group in which they were born without any aggressive behavior from the adult male. The juveniles, in the time shortly before they leave, spend increasingly less and less time with the adult females in the group. However, juvenile males do not change the amount of time they spend near the adult male. This may indicate weakening of matrilineal ties, rather than male aggression, as the main reason juveniles disperse from their natal group. The patas monkey feeds on insects, gum, seeds, and tubers, a diet more characteristic of much smaller primates. The relationship between the patas monkey and the whistling thorn acacia may have inspired The Lorax by Dr. Seuss. ^ a b Groves, C.P. (2005). Wilson, D.E. ; Reeder, D.M., eds. Mammal Species of the World: A Taxonomic and Geographic Reference (3rd ed.). Baltimore: Johns Hopkins University Press. p. 160. ISBN 0-801-88221-4. OCLC 62265494. ^ Kingdon, J.; Butynski, T. M. & De Jong, Y. (2008). "Erythrocebus patas". The IUCN Red List of Threatened Species. 2008: e.T8073A12884516. doi:10.2305/IUCN.UK.2008.RLTS.T8073A12884516.en. ^ Rincon, Paul (2018). "Moustached monkey is separate species". BBC News. Retrieved 2018-03-19. ^ a b c Kurt J. Gron (2006), Primate Factsheets: Patas monkey (Erythrocebus patas) Taxonomy, Morphology, & Ecology. Accessed 2018 July 23. Q.v. for references. ^ Arsuaga & Ignacio 2006, p. 18. ^ "Erythrocebus patas". lobal invasive species database. ^ York & Rowell 1988. ^ Rogers & Chism 2008. ^ Joanna Klein, "Can It Be? The Lorax Sprang from a Monkey? : A New Essay Explores the Possible Real-life Inspiration for a Dr. Seuss Character", The New York Times, August 7, 2018, p. D6. Arsuaga, Juan Luis; Ignacio, Martínez (2006) . The Chosen Species: The Long March of Human Evolution. Blackwell Publishing. ISBN 978-1-4051-1532-2. Enstam, Karin L.; Isbell, Lynne A. (2002). "Comparison of responses to alarm calls by patas (Erythrocebus patas) and vervet (Cercopithecus aethiops) monkeys in relation to habitat structure". American Journal of Physical Anthropology. 119 (1): 3–14. doi:10.1002/ajpa.10104. PMID 12209569. Hall, K. R. L. (2009). "Behaviour and ecology of the wild Patas monkey, Erythrocebus patas, in Uganda". Journal of Zoology. 148: 15–87. doi:10.1111/j.1469-7998.1966.tb02942.x. Kingdon, J. (1997). The Kingdon Guide to African Mammals. London: Academic Press Limited. ISBN 978-0-12-408355-4. Isbell, Lynne A. (1998). "Diet for a small primate: Insectivory and gummivory in the (large) patas monkey (Erythrocebus patas pyrrhonotus)". American Journal of Primatology. 45 (4): 381–98. doi:10.1002/(SICI)1098-2345(1998)45:4<381::AID-AJP5>3.0.CO;2-S. PMID 9702283. Isbell, L. A.; Young, T. P.; Jaffe, K. E.; Carlson, A. A.; Chancellor, R. L. (2009). "Demography and Life Histories of Sympatric Patas Monkeys, Erythrocebus patas, and Vervets, Cercopithecus aethiops, in Laikipia, Kenya". International Journal of Primatology. 30 (1): 103–124. doi:10.1007/s10764-009-9332-7. PMC 2949556. PMID 20976285. Nakagawa, Naofumi (2008). "Despotic wild patas monkeys (Erythrocebus patas) in Kala Maloue, Cameroon". American Journal of Primatology. 70 (3): 238–46. doi:10.1002/ajp.20481. PMID 17854072. Ohsawa, H (2003). "Long-term study of the social dynamics of patas monkeys (Erythrocebus patas): Group male supplanting and changes to the multi-male situation". Primates; Journal of Primatology. 44 (2): 99–107. doi:10.1007/s10329-002-0024-6 (inactive 2018-01-16). PMID 12687473. Rogers, William; Chism, Janice (2009). "Male dispersal in patas monkeys (Erythrocebus patas)". Behaviour. 146 (4): 657. doi:10.1163/156853908X395549. York, Alison D.; Rowell, T.E. (1988). "Reconciliation following aggression in patas monkeys, Erythrocebus patas". Animal Behaviour. 36 (2): 502. doi:10.1016/S0003-3472(88)80021-6. Wikimedia Commons has media related to Patas monkey. This page was last edited on 20 March 2019, at 06:00 (UTC).